Sometimes the best part of a long drive is the chance to think. The road through the Adirondack State Park region of New York is scenic and winding, but also familiar, so as we meandered through on our way down to the I-90 tollway and Eleanor and Emma became engaged with their books (and in Emma’s case, Nintendo games) I had the chance to explore my own thoughts without much distraction. At first I was mostly concerned with “feeling out” the Airstream. Sitting for a long time means little surprises can crop up, and although it towed as nicely as ever and my pre-flight checks turned up no problems other than rusted hitch pin (which I replaced), I was on alert for anything unusual. We weren’t even one mile down the road before I realized something odd was up with the braking; the trailer wasn’t stopping as well as normal. At first I assumed it was rust on the brake discs, but after the rust wore off there was still a feeling that the trailer wasn’t braking as hard as it should. I also got a bit of a sideways push on hard braking, which is sometimes a hint that the Hensley is not aligned perfectly straight. That happens when the hitch is removed and re-installed, but we had already aligned it on the way east in May, so the theory didn’t fit. The hitch alignment is a “set and forget” sort of thing. You don’t need to re-align it unless you remove the hitch head from the trailer, but just to be sure I stopped on level ground and tweaked the adjustment a couple of times. That didn’t seem to fix the issue. I realized the off-center push would sometimes happen to the left and sometimes to the right, which actually suggests that the hitch head alignment is fine. (A minor off-center push in either direction is normal, caused by uneven road surface when you are coming to a stop.) But I never had any type of push before, so what was up? After about 80 miles of towing and fiddling, I realized the cause in a “DUH!” moment. The Prodigy brake controller had somehow gotten set to a lower maximum voltage. This reduces the braking action, which allowed the Airstream to push the Mercedes a little, and thus allowed the Hensley to articulate to one side or another in a stop depending on the slope of the ground. I checked and the Prodigy was set to a max 8.8 volts where it should have been set to 10.0 volts at least (on our trailer, yours will likely be different). I have no idea how it got altered, since the setting can’t be changed without the trailer attached, and the Mercedes hasn’t towed the Airstream since early June. Once I corrected that, we had the normal sensation of the trailer brakes leading the car, which prevents the “Hensley bump” and returned the confident braking feel I’m used to. Other than the brake issue, the Airstream seemed to be perfect, which was great. That’s not to say we don’t have “squawk list” of things to attend to. The silver beltline trim around the lower body edge has faded to chalky white, and in one place has peeled loose. I’m going to get a big roll of the stuff and replace it (an easy job). The plastic propane tank lid is deteriorating from UV exposure and although it’s only cosmetic damage, I’m tired of looking at it peeling up like a bad sunburn, so I’ll probably replace that too. Both of these items can be picked up at Airstream when we drop in next week. We’ve got two more Hehr window gears that are stripping and I only have one spare, so I will be ordering more of those soon, too. Lest we die of boredom with the I-90 NY State Thruway slog, we detoured up through Rochester NY and to the shore of Lake Ontario for an overnight stay at Hamlin Beach State Park. It was a well-reviewed park, with manicured green lawns and good access to the shoreline, with nicely forested campsites in several loops. Being the week after Labor Day, it was barely occupied. Since we arrived at sunset, the entrance gate and offices were all closed, but a friendly staffer passing by said to just grab a site and pay in the morning. I appreciated his helpfulness, although we would have done that anyway. After a long period of sitting, the Airstream did experience some internal discomfort in its black water holding tank. The motion of a couple hundred miles of towing stirred up things inside the tank and the result was a pretty awful smell from the plumbing vent when we stopped. The antidote is easy, a triple dose of enzymatic tank chemical and plenty of water—the travel trailer equivalent of Pepto-Bismol. Two days of towing has brought us to Lou & Larry’s home near Cleveland. This is the best courtesy parking spot in the entire USA, with full hookups, wifi, level ground, and lots of hospitality from our hosts. We’ve come here many times over the years. This time Larry took me to a real camera store—quite a rarity these days—and then his daughter and our friend Loren took us to Cleveland’s Westside Market. When we are in cities it’s a big treat for Eleanor to hit the markets like this. 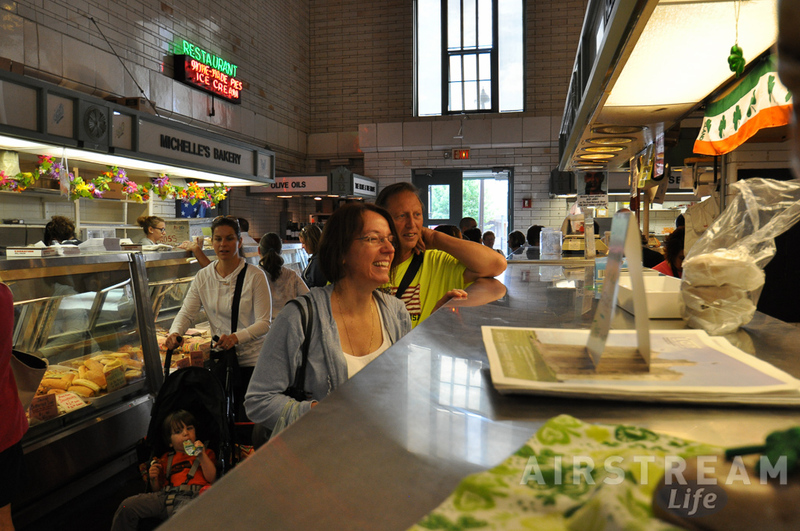 There are a few in the USA that always are worth a stop, such as Philadelphia’s Reading Terminal Market, Boston’s Haymarket, and Seattle’s Pike Place Fish Market. 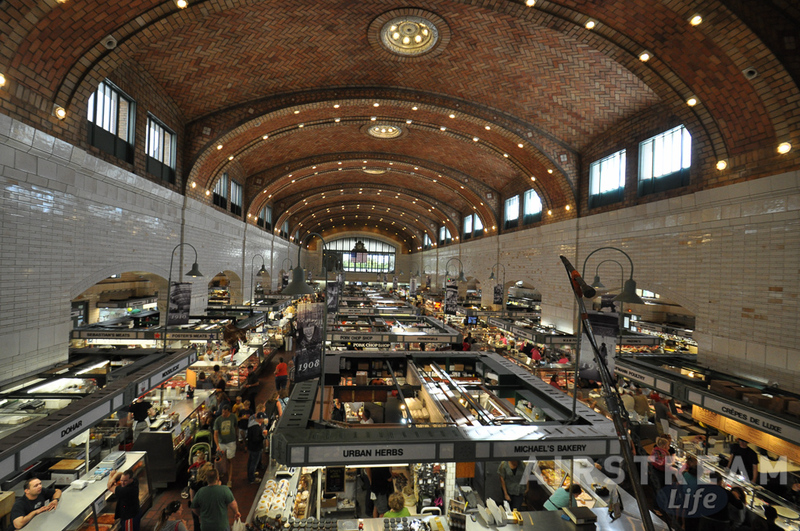 Cleveland’s Westside Market is definitely on that list. For me the attraction is both the food and the architecture. I love looking in the glass cases at the abundance and variety of food, but I often spend as much time looking for photographic subjects in the buildings themselves. Westside Market has a nice feature in its tiny upstairs gallery that gives a great view of the hustling activity below. The building looks almost like it was re-purposed from an old train station, like the Musee D’Orsay, and I love just looking at the fantastic arched ceiling. Eleanor of course scored a few interesting things that will pop up on our table in the next few weeks. I don’t know exactly what she bought; I’d rather be surprised. For now, we can’t seem to eat much of our own food, since Lou & Larry keep hosting parties every night. Last night we had a birthday party for a relative, with about 14 people attending and countertops buried in tasty stuff, and tonight we’ve got more guests coming for corn on the cob and whatnot. We just try to calmly accept the constant flow of friendly faces, meals, and conversation. This is what you have to put up with sometimes when you courtesy park. Hamlin Beach was one of Deb’s childhood hangouts! She drove Zane and I there for a swim on some travels thru there a few years ago. Rich, we used to camp a couple of weeks a year at Hamlin Beach State Park Campground. Somewhere I even have some photos of us and our canned ham trailer, popups, and VW campers we used over the years to camp there. When we visited, the Hamlin Beach exit was the end of the expressway. As for the mystery of the Prodigy resetting itself, it seems to be an occasional phenomenon when you don’t have the trailer connected for a while. The solution, of course, is to tow your trailer more often.